Take HWY 127 north approx. 34 miles. You'll pass "Little Dumont" on the right hand side. Just past Little Dumont you'll see a sign for Dumont Dunes pointing to the right. 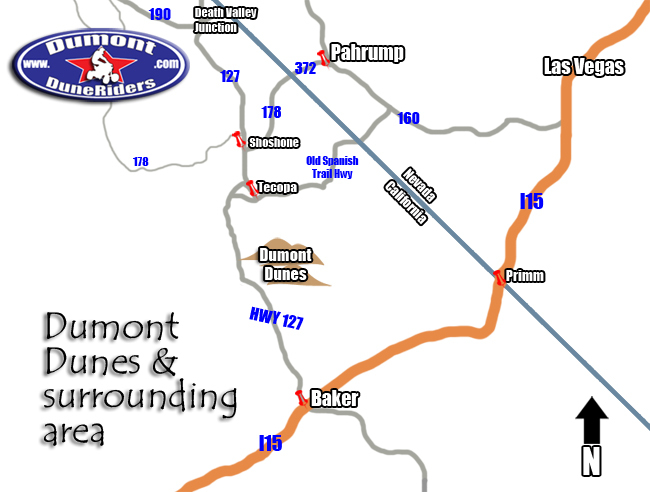 Turn on Dumont Dunes Rd (gravel road). Proceed approx 3-4 miles, crossing the Amargosa River Crossing (cement slab), and pull up to the pay station. Once you past the pay station, stay on the gravel road as it brings you uphill to the top of the plateau.